1950The buyers of this 1950s ranch in North Reading, Massachusetts, fell in love with what they saw. Even so, once they moved in, they wanted the home to reflect their own taste and lifestyle. WORKS by Jesse DeBenedictis listens carefully to new homeowners to help them navigate their dreams through the reality of scheduling, budget, and upheaval that any family faces during a renovation. 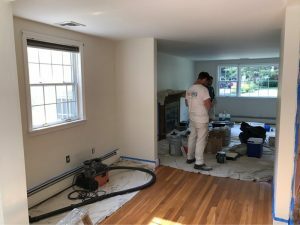 In this case, before the new homeowners moved in, we removed dated thresholds between rooms, upgraded insulation in the basement, sanded and painted walls and ceilings, and even sprayed the chimney to seal it properly. We discovered that the master bedroom had a “false” coax cable outlet installed and that a 1’x2′ area had a roughly 1/16″ thick wax-like substance that was painted over. We notified the homeowners about the cable and we scraped and sanded away the wax-like substance, to create a uniform surface for painting. The team at WORKS by Jesse DeBenedictis is ready to help make your new home into the livable, welcoming space you imagined. We have earned the trust of new homeowners throughout the North Shore of Boston, including Amesbury, Beverly, Boxford, Charlestown, Danvers, Essex, Georgetown, Gloucester, Groveland, Hamilton, Ipswich, Lynn, Lynnfield, Rowley, Manchester-by-the-Sea, Marblehead, Middleton, Nahant, Newbury, Newburyport, North Reading, Peabody, Rockport, Salem, South Dartmouth, Swampscott, Topsfield, Wenham, Middleton, and West Newbury. WORKS by Jesse DeBenedictis is fully licensed by the state of Massachusetts (# CS 91245 and HIC # 178604). 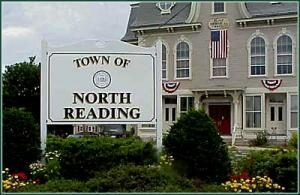 North Reading began as a farming community, founded in 1651 along the Ipswich River. Once a center for saw mills and shoe manufacturing, it is now a commuter town to Boston, with a great love for its old homes and historic buildings. 1950 The buyers of this 1950s ranch in North Reading, Massachusetts, fell in love with what they saw. Even so, once they moved in, they wanted the home to reflect their own taste and lifestyle.